Perhaps it’s because it is slightly unexpected – this art community in the mountains… Perhaps that is just what makes Morton’s burgeoning art scene so charming and endearing… Come to the Roxy Theater in downtown Morton and watch performances leaving you dazzled. Peruse the BCJ Gallery and see fine works of art – from jewelry and pottery to paintings and furniture. Take part in rejuvenating yoga classes at 2nd Street Yoga Studio. There are talented artists in these quiet mountains and they’re taking their place in Morton. Rugged men in tin hats and hickory shirts. Women…well were sparse – this was bachelor territory where young men came to make money cutting timber. Morton was settled as a rather isolated, logging town…so it’s certainly no wonder Morton’s heritage is brimming with color, a touch of catastrophe and triumph. Today, the mark of Morton’s intrepid past is carefully and purposefully woven throughout the community. From the renovated Morton Depot, to the Loggers’ Memorial and two-cell jailhouse, Morton has a story to be revered - and one certainly warranting further investigation. Surrounded by seemingly never-ending forests, pristine rivers and clear mountain air, this is a land of outdoor possibility. Yes, this area is beautiful to look at, but one can reach another level of appreciation by experiencing it. The Tilton River is heralded as a popular salmon and steelhead fishing destination. The dramatic cliffs of Dog Mountain attract hang-gliders all over the Pacific Northwest. 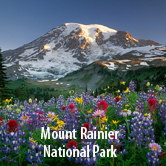 And with Mount Rainier National Park and Mt. 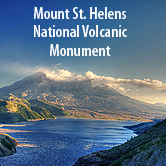 St. Helens National Volcanic Monument within an hour’s drive, it’s a land nationally recognized for its outstanding natural appeal. Check out your options for an overnight stay. Choose from a selection of options to suit your style. Acquaint yourself with our thriving cultural scene. Indulge in the outstanding natural outdoor beauty all around. Find information on weekend events, festivals, theater productions and more.